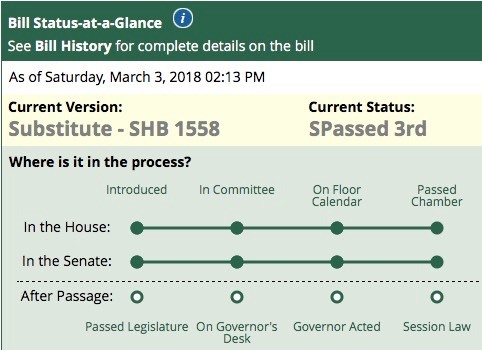 House Bill 1558 passed the Senate on Friday, March 2nd 2018. It had already passed the House on February 12th 2018. it now goes through the next steps to be implemented. 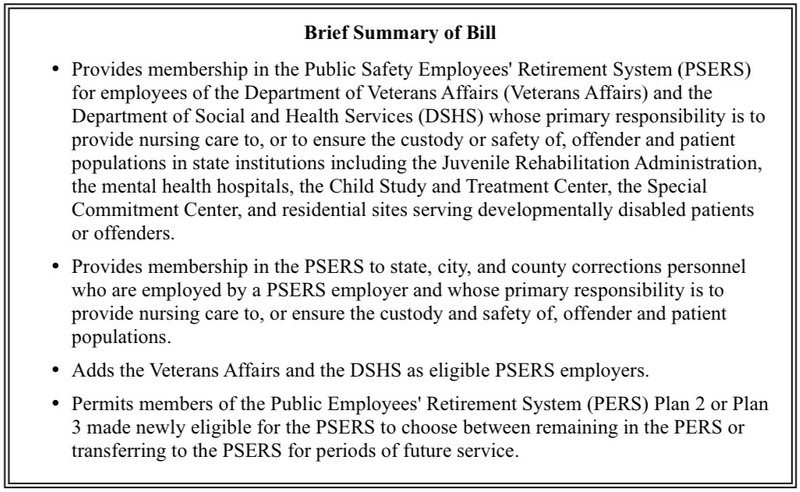 As you can see, the passage of the bill allows DSHS employees who provide nursing care in mental health hospitals and CSTC to opt out of their current retirement plan in favor of the Public Safety Employees’ Retirement System (PSERS). You can view the PSERS Handbook here. Besides the early retirement advantage of PSERS, I will be exploring the other differences between PERS and PSERS in the future. You will be seeing more blog entries in the future… I have been undergoing retaliation for whistleblowing, and have had to slow down my efforts to inform due to legal instruction. Rest assured that the retaliation is being addressed at the highest levels. I will have much more to report soon! Western State Hospital continues to become a more and more dangerous location to work. As employees who confront this issue with DSHS are banished by the current administration to “reassignment under investigation,” brave employees continue to communicate with Olympia for relief. This is yet another call for our legislators for relief before more employees and patients are injured or killed. Note: I have received numerous requests for information resulting from this blog entry. As a result, I have added an addendum to the end of this blog entry which answers many of the questions that have been asked. As stated on my home page, the opinions I express are my own and CLEARLY do not reflect those of DSHS… When this input is provided, often it results in direct retaliation… Retaliation by WSH administration must remain consistent, so that others will not talk and leak this information. Secret withdrawal from Joint Commission Accreditation is something that could NEVER have happened with a “hospital” that was licensed through the Department of Health, laws would have prevented this. Western State Hospital operates under the same laws that applied in its old insane asylum days. This is dangerous. It is up to our legislators to correct this error. Western State Hospital must become a “Hospital” under the law so that employee protections that apply to all other hospital employees within the State, also apply to Western State Hospital. If business practices within DSHS were audited, the level of corruption would become crystal clear. DSHS does NOT keep permanent records of unscheduled absence. DSHS does NOT keep permanent records of how many hours an employee works for a “completed shift.” Should these records EVER be looked at, corruption up to (and including the Governor) will become readily apparent. Who is the keeper of these falsified documents? It is the Consolidated Institutional Business Services (CIBS). It is this division that covers up and divides DSHS budgets so that tax payers do not know the basis of the staffing shortage at Western State Hospital. The Department shares your concerns. Since this needs to be resolved in the context of long-term labor practices and current labor law, it is one of the Department’s top concerns as we enter into collective bargaining discussions. Since that whistleblower was filed in 2014, DSHS has taken no action to remedy the staffing shortage that results from this practice. Indeed, the issues have exacerbated as DSHS has continued to expand the size of administration at Western State Hospital. In my last two blog entries, I have presented that regardless of “the hiring spree” that DSHS touts, the level of overtime continues to expand to the point of regular implementation of mandatory overtime, something that would be illegal in any “hospital” under Washington law… As stated, WSH is not a “Hospital” under the law. While it is a nice perk for over a thousand employees within WSH to work seven hours and forty five minutes per day to receive eight hours per day in wages (through falsified CIBS record keeping), it has directly impacted the safety of my peers as well as those that directly benefit from this perk. Shift change periods are critical times in any hospital, one crew comes on and the other leaves. Imagine a system where the Governor has created a union payoff where certain employees get to leave fifteen minutes early every day during this critical period of time. This is exactly what is occurring at Western State Hospital as well as other DSHS facilities. In 2017, Western State Hospital has broken all records with its level of overtime even after its “hiring spree.” The numbers do the talking for me and are part of public records. What Western State Hospital requires is a full audit of CIBS and its timekeeping system for overtime-eligible employees. A full audit of all DSHS Washington Management Services (WMS) expansions at Western State Hospital since January 1, 2017 is required. From which budget does overtime come from? From which budget does pay for work NOT rendered come from? Is there medicare fraud when DSHS receives $65 million per year claiming staff provided full care for a shift when the majority of staff do NOT work for a full eight hour shift (although they are compensated for it)? We need to end the insanity of the current Administration. Any external audit will show how deep the corruption within DSHS goes. Direct patient care providers put their life and license on the line every day they come to work under difficult conditions where employees often work two shifts per day, often through the implementation of mandatory overtime. Often those persons manning the ward are overtime personnel who do not know the patients. It is a little known fact that ALL of our direct patient care nursing staff members have certification or licensing. If the license or certification is revoked by the Department of Health, the employee can no longer be employed. The same is NOT true of administrators, as their influence on clinical practice is accountable to nobody. DSHS must be given directives to hire sufficient direct patient care personnel to null out overtime, I personally created the process through which this could be implemented. All DSHS facilities need to be licensed by the Department of Health, to allow Western State to become a “Hospital” under the law. Time worked must be measured identically for all overtime-eligible employees, it currently is not. Western State Hospital administration must be de-layered to resemble a medical model where licensed care providers make ALL the clinical decisions, this is NOT currently the situation. To my Federation friends, I am sorry I continue to bring up the truth regarding the hours worked… But continuing this practice endangers all of you the same as it endangers us. We need to tell the truth about staffing. All union and government corruption aside… We have to look after ourselves, nobody else will do it for us. The State Auditor has known about this and other illegal practices for years… This union payoff and perk is endangering all of us. Imagine how many more direct patient care employees could be paid for if timekeeping had not been falsified for so many years. Let’s lay truth on the table and make Western State Hospital safe for all of us. In truth, many people should go to jail as a result of a full audit as taxpayers and the federal government have been defrauded billions of dollars over the years. It could not have existed this long without complete government collusion and corruption. After all… It is only the health of the direct care providers that suffered. After posting this blog I have received a great deal of questions and input. Rather than answer all the emails, I am updating this blog entry with answers to questions asked. It is exceptionally important to note that the Governor received a copy of the report and to understand that it is the Office of Governor that is responsible for negotiating employee contracts under our current collective bargaining process. This is a VERY important point. Please note that the Office of Auditor states 927 employees were impacted by this… That figure is incorrect. 1149 employees at WSH were impacted, note that they did not mention how many employees were impacted in ALL DSHS facilities. It is a substantial figure. Also take particular note of the wording, “we obtained a list.” From who? So in 2014 the Governor gets this resolution and under current collective bargaining processes the resolution must be implemented in contract negotiations. Negotiations after 2014 are concluded and the results are now before the Legislature for funding. Did the Governor implement the “Department’s Plan of Resolution” during negotiations? The answer is no, and this is the very reason why the Office of Governor must NEVER be involved in direct negotiations with labor unions. When I filed this whistleblower, I also filed complaints with other agencies pertaining to this issue. At that time I was also voted in as the Chair of the RN union again. I had ALSO filed a grievance pertaining to falsified timekeeping which directly related to this issue. The RN union withdrew that grievance without my permission. During this timeframe I filed an appeal with the RN Union District Hearing and Appeals Board which was responsible for such withdrawals under the union bylaws… Only to find that the RN Union had NEVER elected a proper District Hearing & Appeals Board in its entire history. So I appealed this issue to the SEIU International… Who had never, either, done the same in order to hear my appeal. The RN union overturned the last election which I won, and made it impossible for myself to run in another election as there was a pending hearing before an appointed body. As a result, I can no longer participate in direct union activities for personal ethics reasons. Union corruption is real. The unions backed our current Governor, who was the head of the office that completed negotiations with all labor unions. Is my friends know, I am a conservative and lifelong Republican… Something which the union had a difficult time adjusting to, as I often presented them a different point of view than they were accustomed to. This brings us back to the State Auditor “Department’s Plan of Resolution.” The Office of Governor negotiates with the labor unions and would have been responsible for reconciling hours worked, for hours compensated. The resolution was always simple, if a modern timekeeping system like KRONOS was initiated, there would be no way that time worked could be recorded differently for different employees. Let me make this clear, the Office of Governor, in my opinion (as a political pay off), disregarded the “Department’s Plan of Resolution” and allowed the continuation of compensation for time NOT worked. This is corruption at the highest level of State Government. I personally view these actions to be criminal in nature. The “top concern” of the “Department’s Plan of Resolution” was buried. Taxpayers pay the Governor’s payoff to the union. Psychiatrists, physicians, psychologists, registered nurses, social workers, and licensed practical nurses are GROSSLY underpaid when compared to the private sector if wages are not adjusted at this time. These positions cannot compete with the private sector and therefore should be provided wages that are real-world based. These positions should be reviewed with regard to public versus private sector wages and compensated accordingly taking into consideration the dangerous environment WSH represents. If these key positions are lost, WSH will be thrown back into the insane asylum days as key clinical personnel (for safety of their own license) must leave State employment after June 30th when wages revert back to previous levels. Wages must be competitive with the private sector or WSH dies. I absolutely find it strange that I must argue for fair timekeeping practices, compensation for actual time worked. But this is how corrupt Washington is at this time, it is an indisputable fact. Also, I will encounter retaliation for providing this information to the public. While I was addressing these issues in 2014 I was reassigned AWAY from timekeeping for almost a six month period (under investigation) because I received the only directive in DSHS to accurately record time in my timekeeping employee records. I was not returned to my normal duties until all other timekeepers received directives to accurately record time worked. DSHS had at that time created a process where CIBS took the timekeeper records and fraudulently recorded that 7.75 hour per day employees had worked eight hours… Which is what continues to occur today. Instead of having supervisors do the falsification of public records, DSHS has CIBS do it. 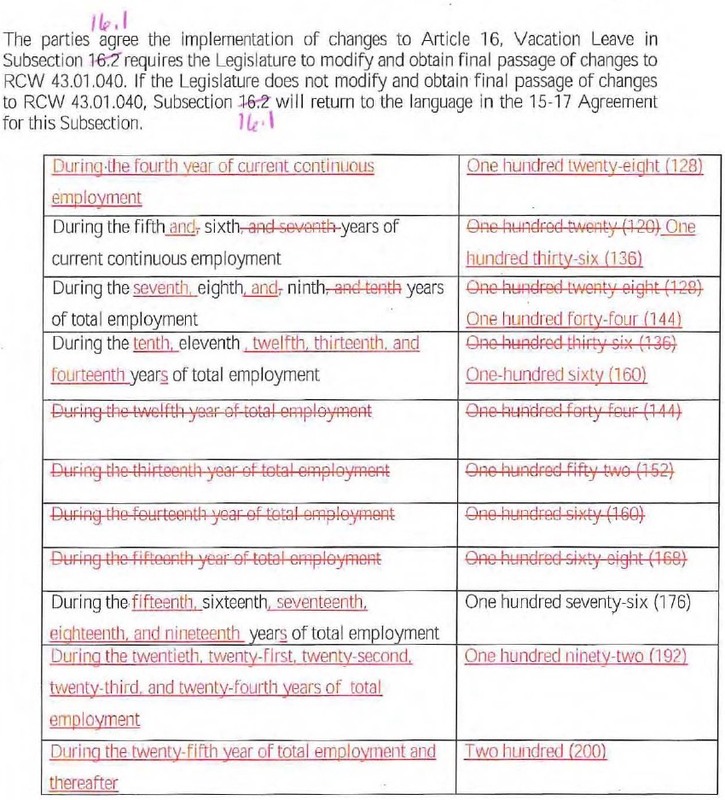 To the Legislature, please compile the cost of paying for work NOT rendered to taxpayers over the years. Taxpayers must see the cost of corruption. Also, research the number of labor and industries injury claims that occur near shift change times. In the past years I have posted much data regarding Western State Hospital overtime use numbers. 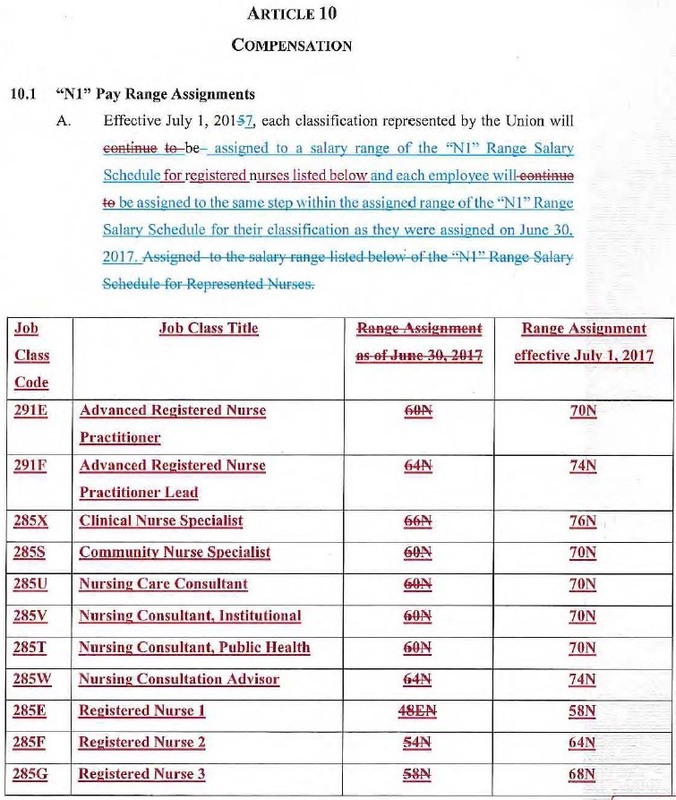 In 2014 I was the co-chair of the Joint Nurse Staffing Committee and had created the first mathematical staffing model for Western State Hospital… Using staffing data I created a method by which we could derive exact numbers of permanent positions that were required to provide base staffing and null out overtime taking all factors into consideration. This data was provided to all levels of supervision within DSHS as well as to the office of Governor. The numbers that were produced were staggering and remain posted in my blog history. All of this data can be found on this website. My projections for staffing in 2014 turned out to be highly accurate based on current statistical data. Recently Western State Hospital had only requested less the half the direct patient care staffing that was required to meet base staffing needs. DSHS states that it has gone on a “hiring spree.” The fact is that DSHS more than doubled the size of its administration while requesting less than half of the direct patient care personnel that were needed to provide safe care. 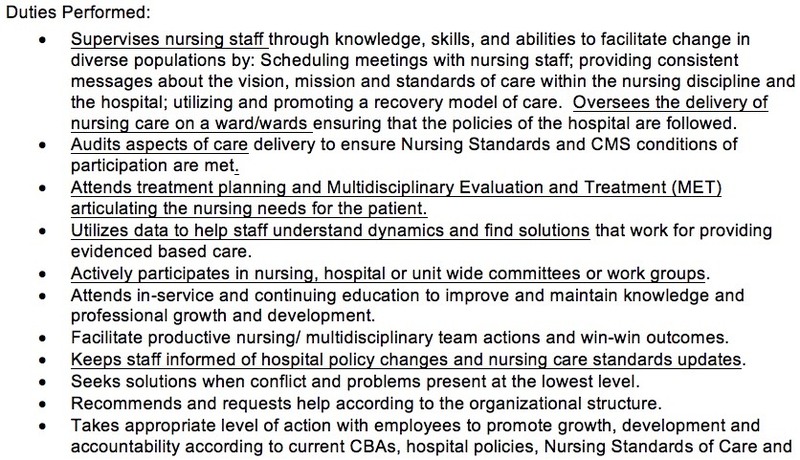 You can see the Joint Nursing Staffing Committee proposal here. Here is a copy of my 2014 staffing model with projections for the need to hire an additional 178 full time direct patient care staff members. Because of my mathematical projections, I have maintained a keen interest in overtime levels to determine the accuracy of my mathematical model projections. My last blog did a similar review. The information is compiled from a program called Scheduler, which tracks direct patient care attendance and overtime statistics. Below are actual screen results from Scheduler… These are reports of the amount of overtime utilized from 1/1/16 to 5/21/16 compared to the amount of overtime utilized from the exact same period of time in 2017. In the above report you will note that from 1/1/16 to 5/21/16 WSH utilized 95,218.5 hours of overtime. Although we cannot utilize the standard eight hour period to reflect a full shift worked for all WSH employees, as Washington Federation employees only work seven hours and forty five minutes per day while all other classifications work a full eight hours per day (see 15 minute issue), at least we can provide an idea of how many true full time employees are represented by the above numbers. 95,218.5 hours divided by 8 (a full shift, except for WFSE employees) equals 11,902.3 full shifts worked by overtime (time and a half wages). A typical 8 hour employee (not a WFSE employee) works 52 weeks per year for 40 hours per week. Thus a typical full time employee works 2080 hours per year. If you divide 95,218.5 hours by 2080 you get the fact that for this period the state could have fully paid 45.8 full time full year employees with the amount of overtime used. 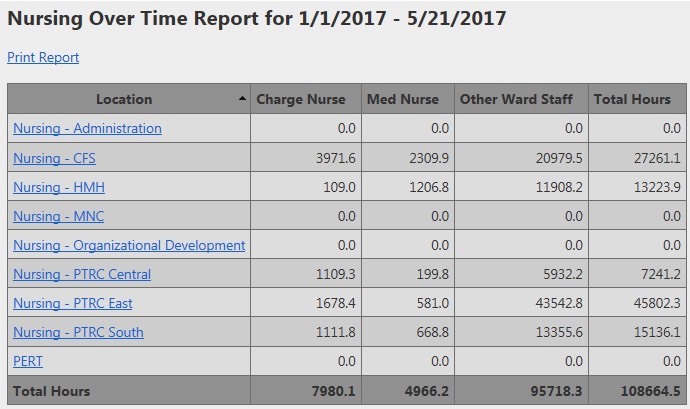 Now lets look at the level of overtime Western State Hospital utilized in 2017 for the same exact period of time as was calculated for 2016. In 2017 for the exact same period of time, Western State Hospital utilized 108,664.5 hours of overtime. That is 13,446 hours MORE than was utilized for the exact same period in 2016 AFTER the “hiring spree.” 13,446 hours of overtime is the equivalent of paying an ADDITIONAL 6.5 full time full year employees. In 2017 from 1/1 to 5/21 (not even a half a year) WSH paid the equivalent of 52 full time full year employees if you do not count the time and a half paid to those employees… Just hours worked. Western State Hospital cannot operate daily without voluntary and/or mandatory overtime. Often minimum base staffing numbers are not maintained. Administration does not currently provide fire check personnel, thus most wards operate with one staff member less per ward than is required to maintain safe patient care. The key to reforming Western State Hospital is to provide adequate direct patient care staffing to meet patient needs. Current statistics indicate the requirement of an additional 130 full time direct patient care employees IF the current need for overtime remains static… It will NOT as we are now going into annual leave season. Only after looking at the full year statistics can we make this projection. My original 2014 projections indicated we needed 178 additional full time direct patient care staff members. The final joint nurse staffing committee report indicated the need for 135. DSHS asked for less than this for direct patient care. As we await to learn the fate of 65 million dollars in federal funding that may soon be lost after an inspection is carried out by CMS, I find myself compelled to comment on the progress of the preparation for the final inspection. The Governor and DSHS has poured millions per year of taxpayer dollars into funding the most extensive expansion of Western State Hospital administration I have seen in over thirty years. If I were a legislator, I would demand a list of all administrative, administrative support, as well as Washington Administrative Services staff that were hired at Western State Hospital since January of 2017. I ask that legislators look at the annual cost of all the added administrators and administrative support staff. None of the taxpayer dollars that were spent on administrative and administrative support funding pertained in any way to direct patient care or in maintaining base staffing levels. I began my service with Western State Hospital as a Registered Nurse in 1984. Within years I was promoted to a nursing supervisor position. I have at one time or another supervised almost all civil wards within Western State. I have also covered for unit managers during this 33 year period, thus am aware of most administrative functions. I have served as the RN Union Chairperson on numerous occasions and have been involved in negotiations as well as grievance procedures at all levels. I have served on most Western State committees and co-chaired several. While serving as the co-chair of the Joint Nurse Staffing Committee I created the first mathematical staffing model for Western State. I created a staffing model that was NOT dependent on negotiation and subjective views… Therefore my staffing model was not subject to “point of view” bias and was objective as it used (employer provided) statistical data to produce the exact number of staff that were required to provide safe direct patient care while nulling out overtime taking all factors into consideration including training. The model would identify understaffing as well as overstaffing… As a result, the RN union did not back the model as it could identify overstaffing and it would essentially end all staffing negotiations based on subjective data. DSHS did not like the model because of sticker shock, the numbers produced indicated that DSHS had grossly understaffed Western State. Now lets look at where we are now with regard to safe staffing. Less than half (far less than half) of the employees that were necessary to provide basic minimal safe staffing at Western State were requested by DSHS. This is because the staffing request was not based on any viable form of objective data. All of the data that is being presented is from January 1, 2017 to April 20, 2017. During this approximate four month (trimester) period, overtime and mandatory overtime use has been extensive and necessary for day to day operations. On may days, Western State does NOT meet base minimum staffing levels. Below is the amount of overtime used at Western State displayed in hours. 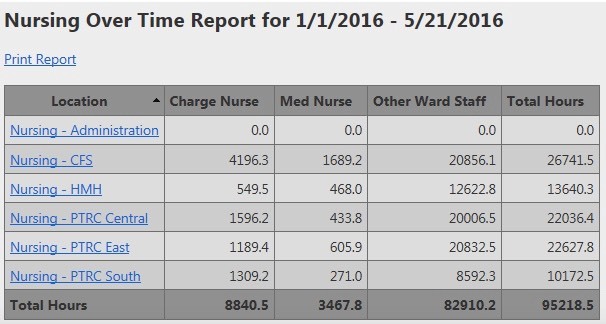 Note that 81,345.8 hours of overtime was required in an attempt to provide base safe staffing levels. It is important to state that base staffing levels for all wards is frequently not attained and staff often work entire shifts with inadequate base staffing. It is important to note that the above numbers are IN ADDITION TO on-call part time personnel that are NOT part of the WSH budget. There are 52 weeks in a year and a full time employee (except for WFSE employees) work an actual 40 hours per week, or 2080 hour per year. 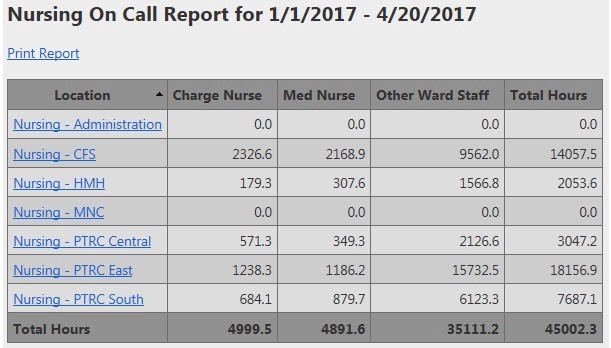 From this almost four month period, if you don’t count the on-call and agency personnel costs or the time-and-a-half these overtime personnel earn, Western State could have funded an additional 39.875 full time direct patient care staff members (funded for the full year). By any measure, this constitutes gross mismanagement of public funding. The next question should be, is Western State understaffed every day of the week? The answer is yes. Below is a table of overtime used from 1/1/17 to 4/20/17 broken down into overtime use for days of the week. Please remember that the above data does not include on-call part time personnel utilized or agency personnel who come at a much greater cost. Now lets look an part time on-call personnel that are utilized daily at Western State. On-call personnel are not part of the Western State staffing budget, therefore on-call data is often never presented to the legislature. From 1/1/17 to 4/20/17 (an almost four month period) part time on-call were utilized for 81,537.4 hours. So during the almost four month period this would have paid for the equivalent of an additional 39.2 full time employees (funded for the full year). Now lets add the overtime full time positions that could have been funded for the full year to the on-call personnel use that would have funded full time positions for a full year. 39.875 overtime + 39.2 on-call = 79.075 full time positions to ALMOST meet base staffing for almost 4 months. Note that the 79.075 full time positions that could have been funded for an (ALMOST) single trimester (four month period) does not take into consideration the additional 19.94 full time positions that could have been funded by the overtime wages alone. The projection for the rest of the year cannot be made from the above numbers because this period of time is not when most annual leave occurs. The overtime numbers will increase by at least a third over the next trimester. But, lets be conservative and falsely state that the above numbers would hold for the next two trimesters. Agency use numbers do not appear in the above figures, thus the RN numbers will be skewed. But lets follow through… If we were to replace the overtime and on-call numbers with permanent full time positions, the projection using the above data would indicate we could fund an additional 79.075 x 3 = 237.225 full-time direct patient care staff members with the amount of overtime and on-call wages that are projected to be paid for the rest of the year. This is the actual full time number of staff that would be required to operate for a full year if overtime use remained static. The addition of 237 additional full time staff would be required to null out overtime and on-call use based on the almost four months of statistics. As stated the true number will actually be more when actual summer vacation data is included. The numbers are staggering due to gross mismanagement by DSHS. I am sure that the public is not aware that DSHS does not even record unscheduled absence into permanent records (only type of leave that was utilized). Thus DSHS is unable to produce any productivity data DSHS-wide. I had the pleasure of being included on the Scheduler program committee which provided Western State with a program that for the first time tracked unscheduled absence, although unscheduled absence numbers do not get recorded on any DSHS permanent record. The numbers do NOT include training as WSH does not currently provide any additional coverage for staff for training that does not exceed four hours. In short, WSH works without its advertised base staffing when training is provided currently. From 1/1/17 to 4/20/17 the following are the nursing department records for unscheduled absence. It is important to note that nursing is the only department within the hospital that is tracked for unscheduled absence. If the other departments were tracked, the use of unscheduled absence would FAR EXCEED that of the nursing department. From the above data, nursing administration, MNC, employee health, organizational development, and PERT data needs to be subtracted as they are not considered full time direct patient care providers. For nursing direct patient care providers, the amount of hours of unscheduled absence used from 1/1/17 to 4/20/17 is 53,961.4 hours or the equivalent of 25.94 full-time positions for one trimester or 77.83 full time positions if the statistics remain static for the rest of the year. Decreasing the amount of unscheduled absence can reduce the above numbers by less than a quarter at most. This can be accomplished through the implementation of a permanent unscheduled absence recording and payroll system like Kronos. I would recommend the initiation of biometric timekeeping systems for all DSHS facilities as well as the implementation of a DSHS-wide attendance policy that includes a published progressive discipline approach for unscheduled absence abuse. DSHS has no true DSHS-wide attendance policy at this time nor does DSHS even record unscheduled absence in any permanent record. Any such implementation would require that ALL employees within DSHS be monitored for unscheduled absence, not just nursing personnel. When you consider the numbers saved in wages, the Kronos system would more than pay for itself. So from the projections from the above provided data (if conditions remained static) we can conclude that to null out overtime we would require funding for an additional 237 full time positions (of which 78 would cover for unscheduled absence use alone). Thus 159 additional full time staff members would be required to just meet minimal base staffing levels, excluding any coverage of unscheduled absence. As stated the numbers will not remain static as we head into vacation season. The numbers are here for everyone to see. These numbers indicate why Government transparency is so important. Administration must be FORCED to allow for diversity of opinions and views without retaliation for the culture to change. Currently, open honest communication courts rapid and violent retaliation. Conversely, being a “yes person” courts administrative appointment and raises as well as inclusion into the group think. All administrative and administrative support positions created after 1/1/17 should be audited and discontinued if the audit indicates administrative redundancy. All funding from those administrative and administrative support positions should be diverted to direct patient care positions in order to null out overtime use and provide base staffing levels. Maintain an objective statistics based staffing model to recommend staffing. Discontinue subjective models. Follow state law pertaining to the Joint Nurse Staffing Committee and its role. Discontinue the HRMS Payroll system as it does not record unscheduled absence, only the type of leave used. Implement a system like Kronos which does permanently document unscheduled absence use and other productivity data. Implement biometric time clocks for attendance due to their decreased infrastructure costs of implementation. Example: No lost time cards or clocking other staff in. Implement the first DSHS-Wide Attendance Policy which includes a written progressive discipline process that can be automated through the Kronos timekeeping system. Standardize a base staffing model for all DSHS facilities which is objective and based on statistics for the facility in question. DSHS, for oversight purposes as well as maintaining accreditation, should license all its facilities through the Department of Health. Thus Western State would become a “Hospital” under state law for the first time. Senate Bill 5512 was recently filed by Senators Becker, Cleveland, and Rivers. Western State Hospital is NOT a Hospital under Washington Law, this bill will make Western State Hospital a true Hospital under the law, thus licensing of the hospital as a facility would occur through the Department of Health. Addresses the licensing authority of the department of health with regard to state hospitals. Requires a state hospital to maintain a coordinated quality improvement program for the improvement of the quality of health care services rendered to patients and the identification and prevention of medical malpractice. Authorizes the medical quality assurance commission or the board of osteopathic medicine and surgery to review and audit the records of a quality improvement committee's decisions in which a physician's privileges are terminated or restricted. Find the original HB 5512 here. Find the substitute HB 5512-S here. This is the single most important Bill I have seen that would directly address the root problem of Western State Hospital not being able to retain accreditation and Federal funding. 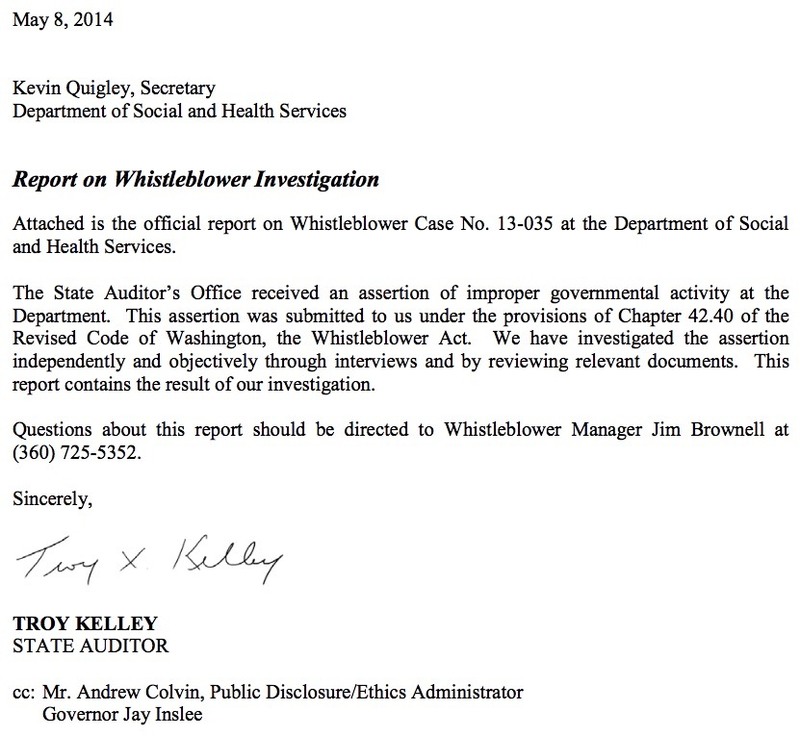 As a multiple whistleblower, I can state that the root cause of Western State Hospitals problems comes from the fact that Department of Social & Health Services KNOWS it does not need to follow the law that would pertain to all other hospitals within Washington because Western State is NOT a legal “Hospital” at this time. 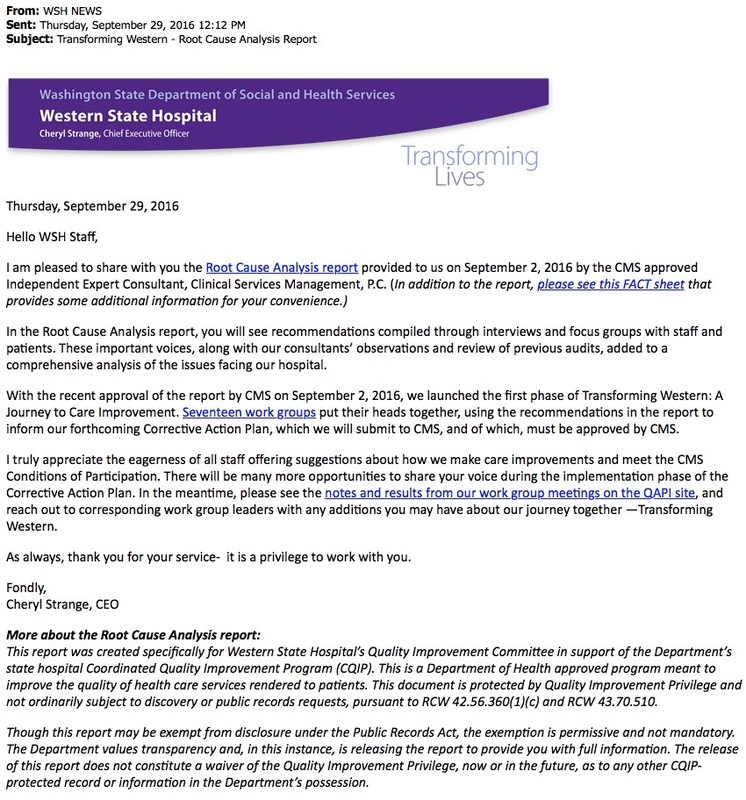 Click here to see a document which was recently created by DSHS to prevent reporting, the document itself points out the fact that Western State is NOT a hospital. It is very important to understand that this is the root cause of the current corruption within DSHS. This is why this particular Bill hits the nail on the head to actually correct the problem. I have been elected in the past to serve as Chair of the Registered Nurses of Western State Hospital on numerous occasions. I have served on most of Western State Hospitals committees, and have co-chaired some of them. I have over thirty years of experience at Western State Hospital as a nursing supervisor and continue to serve as a nursing supervisor currently. Based on all my experience and knowledge of the current situation, I highly recommend passage of SB 5512 into law. We were recently asked to go to a meeting where RN’s were to vote on the approval of a labor agreement that we were never allowed to view. Many of us voted “no” rather than approve a document sight unseen. I am happy to state that I have been provided a copy of that top secret document and that it is available here for your own download. Click here to see and download a copy of the SEIU 1199NW 2017 to 2019 Tentative Agreement for Labor Contract. I have not had time to look at all the sections and appendixes and pay schedules were not attached to the document. I have cut and pasted the areas that pertain to raises in pay and vacation leave. Take time to read the entire document. Let me know about your opinions! AMMENDED BLOG (9/30/16) In my haste to respond to the release of the secret CSM Consultant report I missed a few stitches… I will address the difference between RN3 and Ward Administrator position descriptions and correct false data within the report itself which claims that Non-RN4 Unit Managers were a factor at WSH historically when they were not. Also of note is that Ward Program Managers only existed for a couple of years within WSH history. Ammended input is in red. Please note that the report does NOT mandate the implementation of $2.6 million massive expansion of administration in the form of “Ward Administrators" (Washington Management Service positions). In short, DSHS openly lied to get an additional $2.6 million per year in unnecessary funding (in lieu of using these funds for additional direct patient care provider positions) blaming this report DSHS thought would be kept secret from the public and Legislature. A severe Unfair Labor Practice has occurred as DSHS Administration forced rapid adoption and funding of 28 administrative positions prior to any form of proper disclosure and demand to bargain processes taking place. 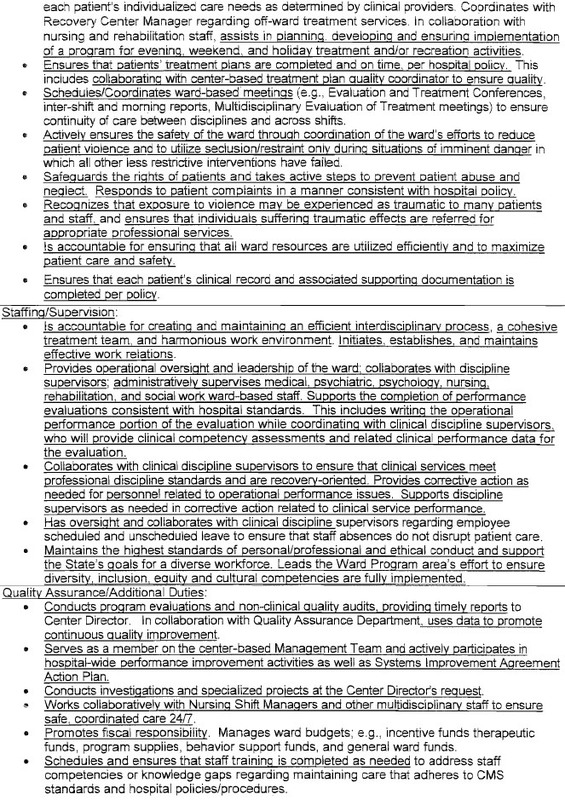 Submitted with the CSM Consultant report was the following fictional document… It is DSHS’s spin of the report. The above statement which was provided to all personnel and all Labor Unions was a complete fabrication. It was a fabrication based on the belief that nobody would ever be allowed to see the CSM Consultant Report. The Legislature should immediately eliminate the funding it has already approved for Ward Administrators. It was a cognitive leap to not openly discuss the report with all personnel because the above data presents a more simple solution than the costly one that was proposed. Why did DSHS not IMMEDIATELY present the Ward Administrator concept a month ago to the labor unions as the concept represented a radical change in work conditions? Perhaps they did not want the following information to be presented to CMS prior to THEIR plan approval and funding. A ward based leadership model already exists on each ward. The Psychiatrist is the team leader and prescribes medications and approves treatment team recommendations for behavioral treatment based within their scope of practice under the Uniform Disciplinary Act. Nursing personnel (Charge RN2’s, LPN’s, PSN’s, MHT’s, PSN’s, and IC’s) are under the direct supervision of a Registered Nurse 3 who has interdependent role and oversees specific functions of clinical care through the delegated authority of the ward Psychiatrist. It has been the normal delegated role of the Registered Nurse 3 to perform routine audits of care and ward quality care processes, and assures standards are maintained through completion of employee performance evaluations taking input from other members of the treatment team. RN3’s coordinated training schedules when WSH still had yearly competency training. Under the current structure, the RN3 is the middle level ward manager. Accountability is built into the ward structure through the Uniform Disciplinary Act. Other members of the treatment team are the Psychologist and Social Worker who are both licensed and perform their duties also pursuant to their scope of practice under the Uniform Disciplinary Act. Why has this structure failed in the recent past? Western State Hospital did not have enough charge nurses (Registered Nurse 2’s) to provide seven days of coverage through three shifts, thus WSH Administration often used RN3’s to cover as charge nurses (RN2’s) instead of allowing them to regularly perform their primary supervisory job function. By having RN3’s serve frequently as RN2’s, the normal supervisory roles of the RN3 were fractured as work relationships frequently moved from peer lead worker to supervisor and back creating an undefined and ever changing supervisory relationship. While some unit RN3’s performed RN2 jobs on various wards, the other unit RN3’s often covered from three to six wards preventing true supervisory oversight. By never requesting the minimal level of staffing required to null out overtime and provide full coverage for a three year period, DSHS Administration found itself unable to allow yearly training to continue. Competency training for all nursing personnel was eliminated in early 2015 and has NOT be reinstated to this day. RN3’s continue to be frequently assigned to RN2 duties due to the past acts of an incompetent administration. Rather than creating a $2.6 million per year additional administrative layer, additional full time RN2’s can be funded to allow RN3’s to perform their normal functions as delegated ward managers. RN3’s perform all of the functions described for Ward Administrators exempt for the fact that there is one RN3 for each shift rather than an ineffective 24 hour coverage unreasonable expectation. 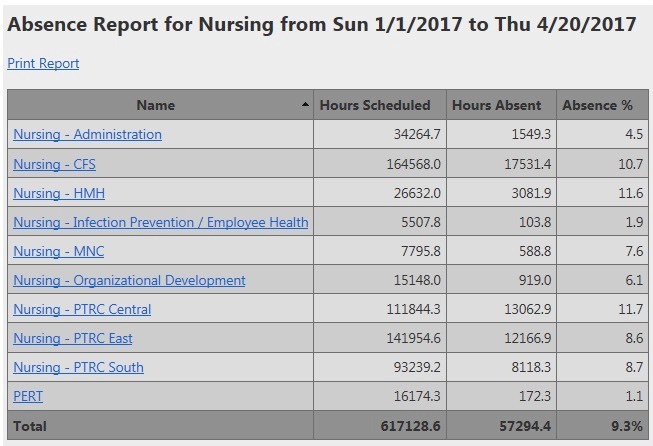 The Joint Nurse Staffing Committee requested 114 additional full time RN2’s, but DSHS only funded 51. Had the CSM Report been provided to direct patient care providers for input, the recommendation would be to allow RN3’s to act as delegated ward managers during their assigned shift thus utilizing existing supervisory structures without creating yet another additional layer of administration. The reporting hierarchy would be optimized and the ward based leadership model would be strengthened while remaining within the parameters of scope of practice and Uniform Disciplinary Act. Historically speaking, for a majority of the past 32 years I have worked at Western State Hospital, the Unit RN4 was the sole Unit Manager for each unit. Only within the Phillips Administration and Adler Administrations were SEPARATE additional unit manager concepts implemented. The RN3 was the ward manager who performed quality assurance checks, scheduled training, performed TJC Accreditation preparation, performed CMS inspection preparation, performed all nursing timekeeping and scheduling, hired all nursing personnel, was responsible for corrective action, completed evaluations, and participated in the patient transfer process representing the entire treatment team of the ward. For a majority of the past 32 years, it was common for an RN3 to be the ward manager of two wards rather than one. For a majority of the past 32 years, there was a simple chain of command in which important information would go directly from the RN3 to the Director of Nursing without any additional layers of administrative personnel. There was no such thing as “upper administration” or lateral duplicate administration positions as exist at this time. In the Phillips and Adler Administrations, numerous new layers of administration were initiated which essentially destroyed all previous communication structures. The Unit Manager name was taken from the RN4 and given to another Administrator who may or may not be a licensed clinician, this Administrator was now the main communication contact with “upper administration,” when previously there was NO FORM of “upper administration” as exists now. In the Phillips Administration for a few year period, Ward Program Managers were implemented. Ward Program Managers replaced the traditional role of the RN3 on each ward as it related to coordinating care with the treatment team and nursing personnel. Thus Ward Program Managers become the chief communicator of ward needs to the newly formed Unit Manager that was not an RN4. That Administrative Unit Manager become the main communicator to “upper administration” which consisted of yet another layer for administration which was then headed by Rae Simpson, the same person that is now advocating for the return of this concept. She was one of the few persons that was allowed to see the CSM Report prior to its release yesterday. For many reasons, the Ward Administrator is a flawed and failed concept which creates additional and unnecessary layers of administration, destroying clear lines of communication and feedback. When the massive expansion of administration was implemented, suddenly paperwork and forms become unmanageable as the persons that were charged with competing those clinical forms were no longer in the true communication loop. Simple structures produce supervisor communications over complex ones. In fact during the Phillips administration, the structures were so complex at even external agencies were unable to trace accountability to anyone as Ward Program Managers were NOT active practicing clinicians, the blame always went to the Psychiatrist, Psychologist, Social Worker, or Nursing Personal. Further, the Ward Program Manager provided input into employee evaluations blindly as corrective or other action was confidential and not subject to an external administrators knowledge. It was a nightmare scenario. Luckily the nightmare did not last long. In the job description above, what you are seeing is DSHS attempting to place a square peg into a round hole. Even though they CANNOT legally delegate or clinical care assignments or modify assignments, the appearance must be made that they have some form of supervisory/administrative duty or they cannot meet the criteria for being a Washington Management Services Employee. This is due to the Washington Management Service Laws. To be a Washington Management Services employee, one must meet the definition of manager or managerial employee under WAC 357-58-035. I would argue that a Ward Administrator cannot legally meet the above criteria because of the clinical setting and scope of practice issue. A Ward Administrator COULD meet the criteria if they were a Psychiatrist or Registered Nurse who have authority to modify clinical delegated duties or assignments. Also, there is mention of term “Administratively Supervises,” which is not defined under Washington law… Actually I was unable to find a definition of the term Administratively Supervises, what does it mean? I suggest that every person review the report in detail. Based on the reports' contents, I have no confidence in the current DSHS Administration. It is clear that it was their intent to fraudulently obtain millions of dollars of funding per year based on what they thought was a SECRET report that NEVER recommended such action be taken. This event shows why transparent government is essential. The Governor and Legislature should de-fund the “Ward Administrator” concept and utilize that funding to provide sufficient permanent full time direct patient care personnel, food aides, and custodial (environmental) care employees to null out routine overtime use. This would eliminate the need to retain expensive non-perm on-call personnel and agency personnel that are not part of the basic staffing budget. Additionally, license Western State through the Department of Health to turn it into a true “hospital” under Washington Law. This act would create mandatory reporting relationships (thus preventing routine DSHS cover-ups) and routine inspections through the Department of Health to assure compliance with all State hospital laws, this is something that has never been done in the past. As stated in past blog entries, DSHS has issued directives to prevent disclosure of serious events. Becoming a licensed true hospital will prevent the administrative abuses that resulted in Western State losing its accreditation and possibly CMS funding. Further, all protections that apply under Washington law would apply for the first time for Western State employees, it would be illegal to implement mandatory overtime on certain classifications of personnel and additional food aide personnel would be required to meet safe food laws and standards. This will require DSHS to discontinue covering up the staffing shortage that DSHS had denied for the past three years. Request the overtime, agency personnel use, and on-call personnel use numbers for the past year. DSHS must never be allowed to have direct facility license oversight of itself again. I note that communication and reporting relationships is a key issue throughout the consultant report, but in this case the consultants missed the root cause that Western State is NOT a hospital under Washington Law. It has now been verbally confirmed that the top secret CSM Consultant report to CMS did NOT contain any specific written mandate to create a $2.6 million per year expansion of administrative Washington Management Service positions in the form of 28 Ward Administrators. Numerous freedom of information act requests and public disclosure requests have been made for the top secret CSM Consultant report to CMS. While the State has done everything in its power to block transparency of government, we expect CMS to provide a copy of the report via the Federal government shortly. DSHS Administrators lied to us when they issued the Ward Program Administrator Frequently Asked Questions document. The Unions were presented by DSHS with an EMERGENCY mandate to initiate WPA’s without negotiation of even IF the positions were required as they represent an extensive and unnecessary change in work conditions. What occurred was a clear Unfair Labor Practice. DSHS refused to provide a copy of the CSM Consultant (taxpayer funded) report to the Unions to show the language that allegedly mandated their initiation and justification. WPA’s are a resurrection of Ward Program Managers, a failed process that was tried in the past many years ago. After elimination of Ward Program Managers, Western State Hospital operated with full Joint Commission accreditation and full CMS certification and funding for years at great savings. Then, the Adler administration came into existence and destroyed everything by expanding administration and administrative support personnel while neglecting and refusing to look at overtime numbers to provide sufficient direct patient care providers. As stated in the past, I was present when Adler denied that additional direct patient care personnel were required even after Legislators showed him slides of the astronomical overtime numbers. It was in May of 2016 that DSHS administration voluntarily and secretly withdrew TJC Accreditation keeping the matter top secret while knowingly (fraudulently) advertising to the public and job seekers that Western State Hospital was fully accredited. Transparency does not occur within the current Washington government. What we have witnessed over and over again is cover ups and suppression of information to oversight bodies at WSH personnel. Western State Hospital is incapable of operating daily without extensive use of overtime, non-permanent on-call personnel, agency personnel, as well as ever increasing events of mandatory overtime. Western State Hospital requires enough permanent full time direct patient care providers to null out almost all overtime, as well as eliminate the need to have non-permanent on-call personnel and agency personnel who are not covered under the basic staffing budget. Rather than use precious funding for sufficient permanent direct patient care personnel, DSHS Administration sees its priority to expand 28 additional and redundant administrative positions to perform functions that are already completed by existing treatment teams. The reason for keeping the CSM Report top secret is two fold… Prevent direct patient care providers from seeing the report and providing input on the best way to solve problems with existing supervisory resources, and cover up all the issues during an election year. The truth is that we can determine exactly how many permanent full time positions will be required. What the current administration has asked for is grossly insufficient. The overtime, mandatory overtime, agency use, non-permanent on-call use, speaks for itself. We simply cannot allow an incompetent DSHS Administration destroy our CMS funding by proceeding down the current path. We have to act independently to display our rights of free speech to impose transparency upon DSHS by informing the public of what is going on. We need to assure that the Legislature does NOT allow continued funding of an administrative expansion in lieu of providing permanent direct patient care providers, custodial services personnel, and food aides to null out overtime. A petition has been created for all Western State Hospital personnel to sign. Also, we will be discussing the initiation of informational picketing (RCW 9A.50.060) and scheduling for such events to take place across the street from the Western State Hospital main entrance. Do NOT participate in informational picketing during your work hours, this must be done ONLY during off duty hours! We will also be creating appropriate media events and taking out newspaper ads. A key point in fixing Western State is to have it become a true “Hospital” under Washington Law. Western State must become a fully licensed facility through the Department of Health to become a true licensed “Hospital.” When that happens, it sets up mandatory reporting relationships and would apply existing laws to Western State Hospital that apply to ALL other true hospitals… For instance, RN Mandatory Overtime is illegal in Washington for true hospitals, but not currently Western State as it is not a hospital under Washington Law. Currently WSH can cover up events per directives, but if Western State was a hospital under the law there would be MANDATORY reporting relationships with the Department of Health. This would end DSHS cover ups and incompetent administration as they would be accountable to ALL hospital laws. This one issue is the true key to assuring that Western State Hospital remains fully TJC Accredited and CMS Certified. Working together we can save CMS funding and bring back full TJC Accreditation, despite the current Administration. I look forward to hearing your input. Please take time to view the press conference by Bill Bryant which occurred earlier today (9/21/16). In the press conference he makes mention of many issues which I have addressed on my recent blog. Western State Hospital indeed does NOT need a $2.6 million a year expansion of administration. The corruption must end. Today the first position description of a Ward Program Administrator made it out to the wild before it had been posted at careers.wa.gov. Governor Inslee (one of the only persons allowed to see the taxpayer paid CSM Consultant reports) had apparently approved the funding for the 28 Washington Management Services positions which earn $85,000 to $93,000 per year according to a WPA FAQ Sheet. This is a $2.6 million per year (plus) unnecessary and unwarranted expansion of administration that is being made in lieu of funding direct patient care positions such as Food Aides and Direct Care Nursing personnel that are desperately needed daily to man the wards. Western State Hospital cannot currently operate without use of extensive overtime and having nursing personnel work daily out of their job class to perform food aide and other classification duties. What we are witnessing is massive incompetence operating within great secrecy at the highest level of State Government. How could this happen without direct patient care personnel input? All direct care personnel at Western State Hospital have been kept blind during this election year allegedly due to the wording contained within the Service Improvement Agreement that was entered into with DSHS and the Governor. It has been interpreted by DSHS and the Governor to state that ONLY one or so selected individuals (selected by the Governor) would ever see the report that was submitted to CMS by the taxpayer paid CSM Consultants, and that (based on these selected individuals) interpretation of the consultant reports, correction recommendations were being implemented and funded by the Office of the Governor (Office of Financial Management) while maintaining absolute secrecy from the public. I make the assertion that if the top secret CSM Consultant report was made available for the public to see, we would learn that the $2.6 million per year expansion of administration was never a literal component of that report. This was actually confirmed by interactions that the doctors union had with consultant personnel. Rather it was the interpretation of the several individuals (administrators) that were allowed to see the document as their vision of a solution to one of the 101 issues that were being addressed. The one thing that has been consistent over the past two to three years was the consistent massive expansion of administration at Western State Hospital at the cost of quality patient care, accreditation, as well as ultimately federal funding. It is the direct patient care providers who should be providing the suggestions and input as to the appropriate corrections for Western State Hospital to address input contained within a PUBLIC consultant report. The fact that the consultant report is top secret appears to be a component election year politics where transparency must not be allowed to occur or the incompetency would be out there for everyone in the public to see. To the Legislature, DO NOT FUND this expansion of administration until you are provided a copy of the initial CSM Consultation report that was submitted to CMS for approval prior to the request for the administrative expansion (administrations’ self prescribed fix). 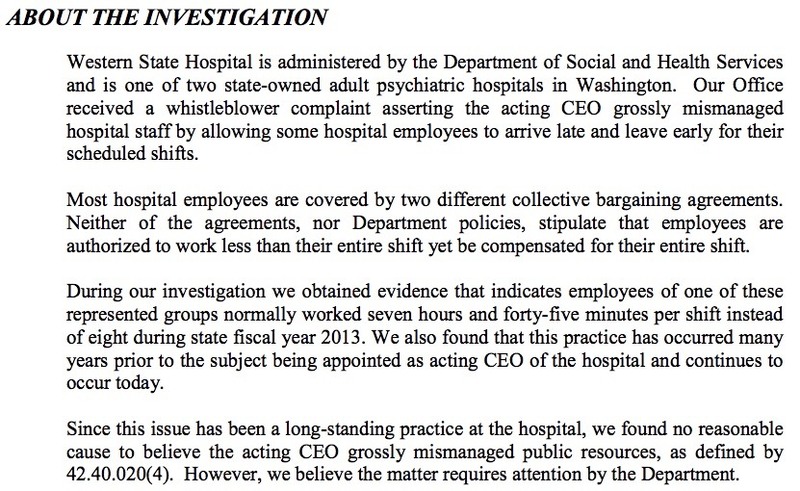 DSHS and the Governor have been involved in an elaborate Unfair Labor Practice by telling all labor unions that Western State Hospital was mandated by CSM Consultants (and then CMS) through the top secret consultant report to create the $2.6 million per year expansion of Washington Management Services positions for additional Administrative personnel. If the top secret report does not specifically call for the massive expansion of administration (if there were no alternatives that could be provided by existing supervisory or management structures), then the meetings with all the labor unions were based on a fraudulent premise that would prevent open negotiation of a massive change in working conditions which would be detrimental to all ward operations. This concept was tried and failed in the past. I assert that one of the individuals that was allowed to see the top secret report and make recommendations was the SAME person that brought Western State Hospital that same failed concept in the past. Further, we have all heard that specific employees have already been promised those positions even PRIOR to their posting at this time. The corruption of the WPA position process is extensive and warrants a full investigation as it was the last time it was implemented. I remind everyone that Western State Hospital maintained accreditation and CMS certification for half a decade after the failed Ward Program Manager concept was abolished at great savings to the State. I remind everyone that prior the Inslee Governorship, Western State Hospital constantly maintained full TJC Accreditation and CMS Certification and funding. What happened to Western State Hospital did not happen overnight, it took an extended period of time (years) for DSHS Administration to cover up ever growing and out of control overtime use while expanding administration and administrative support while never requesting additional direct patient care positions until this year when we were on the verge of losing all federal funding. The basic same DSHS Administration that has brought us to our current situation are essentially the same DSHS Administrators that are the only ones that are allowed to see the top secret consultant reports. Would a competent administrator have allowed this current situation to happen? Would a competent administrator have ever allowed taxpayer paid consultant reports to be kept top secret from the public? We can end this nonsense in November. Now lets look at the $2.6 million per year monstrosity that Inslee’s DSHS has cooked up. Each ward currently has a Licensed Psychiatrist (MD) that serves as the head of the treatment team. Members of the treatment team are often a medical doctor, psychologist, a social worker, a registered nurse, and other direct care provider nursing positions (nurse aid class employees). The Psychiatrist, based on interviews with the patient and input from the treatment team prescribes medications. Constant input from treatment team members is provided and patient treatment plans are created and modified to provide the best care possible with the intent to return the patient back into the community as quickly as possible. All direct patient care providers are bound by the Uniform Disciplinary Act, meaning that our licenses to practice our profession are dependent on our behavior and personal actions. What this means is that the psychiatrist, psychologist, social worker, registered nurse, licensed practical nurse, and or nurse aid class employee are held accountable for all of their personal actions, violations of conduct will result in revocation of the license to practice by the Department of Health after an investigation and hearing. In short, licensed direct patient care providers are held personally accountable for their actions, thus being directed by someone to perform an unsafe clinical practice is no defense for performing the practice that you may have been directed to do if it endangers the patient. The licensed provider is accountable regardless of who issued the inappropriate directive. The entire treatment team of each ward is entirely bound and held accountable by the Uniform Disciplinary Act. and/or managerial experience, including program administration, personnel management, and budgeting. • Master's degree or higher in a ciinical field and clinical licensure in one's specialty. skills, Ability to lead others through modeling and provision of accurate and constructive feedback. Thus the person that is placed in a WPA position to oversee ALL clinical care will be an individual that is NOT working within the confines of their specific licensed scope of practice, if they are licensed at all. Thus the Uniform Disciplinary Act operates independent and exclusive of a WPA. What is a WPA expected to do? Describe the scope of accountability. Thus Inslee’s DSHS is placing an administrator in the role of administrative supervisor of all clinical care personnel (along with their practice) with zero licensed accountability of their own actions under the Uniform Disciplinary Act as each WPA would be performing duties well outside of their scope of practice if the WPA was even licensed. If the WPA process were to be implemented in a legal manner within which scope of practice ruled the basic qualifications for the position, a Licensed Psychiatrist (MD) would have be become the Ward Program Administrator by default as they are licensed to administratively supervise the clinical care of all of our patients. Indeed, I would further point out that Western State Hospital Medical Bylaws and credentialing processes come into play in this matter and that the Medical Bylaws are incompatible with the WPA concept with the current basic qualifications listed. I assert that a Ward Program Administrator concept cannot be implemented legally without endangering our entire patient population if the current listed qualifications were applied. Further, should 28 additional Psychiatrists be required to administratively supervise 24 hour clinical care each ward, the costs would be prohibitive. Luckily the Ward Program Administrator concept is absolutely not required as existing structures already provide this service for a 24 hour period in full compliance of the Uniform Disciplinary Act. Our loss of accreditation was a decision made by the Inslee DSHS Administration. Our current SIA and possible loss of CMS funding was the direct result of actions taken by the Inslee DSHS Administration to massively expand administration and administrative support for the past two years WHILE completely neglecting to ask for sufficient direct patient care personnel to carry on daily operations. I have no confidence in the Inslee DSHS Administration. I strongly suggest that all labor unions work together to expose the corruption that has taken place by demanding a copy of the top secret taxpayer paid CSM Consultant Report and then release that report to the public and legislature for review. I also suggest that we discuss immediate informational picketing of Western State Hospital in order to inform the public of the waste of public funding through administrative expansion that is being implemented in lieu of DSHS providing sufficient direct patient care personnel to provide daily care without massive daily use of overtime, on-call personnel, and agency personnel. We were recently told that additional direct patient personnel may not be funded, but oddly the administrative expansion is the focus of all the Inslee DSHS Administration efforts at this time. An additional point: Eastern State Hospital was just fully accredited without having to expand their administration. Perhaps their approach to minimize administration and administrative support and concentrate on providing adequate direct patient care providers and equipment may have some merit.